Designed for people in the spirit of New Urbanism, the Mason Street North project will be developed to support and encourage community by creating an attractive and high quality environment for people to work and live. In addition, Wonderland Hill Development Co. and Wolff/Lyon intend to implement a community based marketing approach that facilitates the involvement of future residents and commercial tenants in creating a vibrant and sustainable mixed-use community. 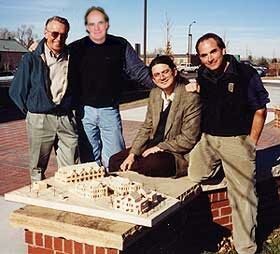 A unique partnership between Jim Leach of Wonderland Hill Development Co. and John Wolff and Tom Lyon of Wolff/Lyon Architects is being created for the Mason Street North project. They bring over eighty years of combined development and design experience to the project. Wonderland is the leading developer of cohousing communities in the U.S. and brings to the project its extensive experience with community building. Both companies have been involved in nationally recognized developments. Wolff Lyon has recently completed several mixed-use projects, one of which received design awards from both the Colorado American Institute of Architects and Historic Boulder. Their 8th & Pearl mixed-use project in Boulder recently received a Charter Award from the Congress for the New Urbanism. The general contractor selected for Mason Street North is Fort Collins based Drahota, Inc., bringing over 32 years of construction experience to this downtown development. The Drahota team includes: Jim Swartz, Project Manager; Bob Fluck, Superintendent and Sue Parks, Project Coordinator.